Hello Sassy friends... we are hoping that all of our friends in the Northern Hemisphere are staying warm.. and to our friends below the Equator.. be cool! It's time for a new challenge and all of that stuff that goes along with it. Before we get to all of that stuff, the design team is sending out a really special thank you to JanetLynne... what a great guest designer we were so blessed to have join us. We appreciate you so much, JanetLynne (and we hope we didn't wear you out with all of our sassy stuff!!). We certainly enjoyed all of the talent you shared with us during the time you were with us. Thanks so much for all of your contributions! You lucky people!! Just contact Sassy Cheryl via email so you can make arrangements for your prizes. Enjoy! This week (and for all of December), our very Sassy Judy is hostess and she picked a great theme!! Snowmen! (snow 'people' for those that like to be politically correct!). Sassy Cheryl is renown for her snow men, so what could be better? Chocolate? Perhaps.. well maybe.. well, okay, chocolate might be better... but not much better. 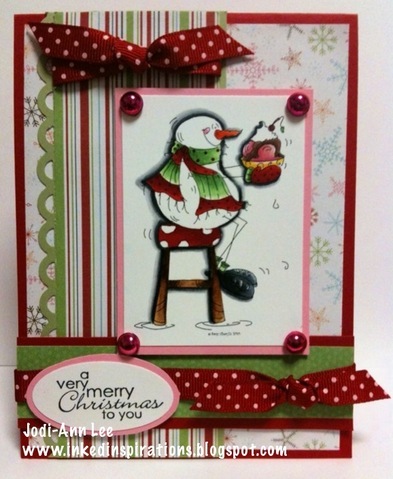 Take a look at what the sassy team has conjured up for Judy's challenge this week. Aren't these snow people just the cutest? Sassy Cheryl creates so many cute snow people. To join in our challenge, just create a card or paper project using an image from Sassy Cheryl's shop. Then post it to your blog or online gallery, then link back here. The team will stop by to say hello and leave you a bit of our sassy love. Wow another great selection of cards etc from the design team, its always a pleasure to visit this blog thanks for the inspiration just need more time to craft lol..
All of the cards are just wonderful! Such wonderful cards my Sassy Girls!!!!!!!!! ANother gorgeous batch! I am so excited to win the ceramic piece!! It is just adorable! I just got home from Hobby Lobby where I bought the snowman platter and found out I won this piece. Talk about a great day! 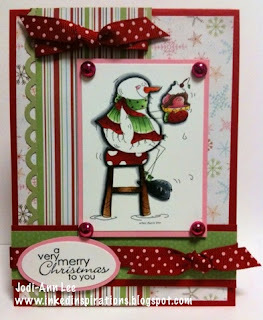 The Sassy Girls' cards are fabulous and I can't wait to get going on another card for this week's challenge. Another bunch of craftastic cards!! Way to go, ladies! Love the Sassy Snowmen and the fab Design Team's samples.